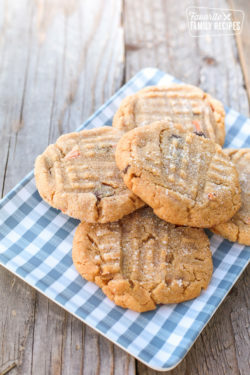 Peanut Butter Cookies are sweet, chewy and make the most satisfying after school snack. This is the easiest, softest, best recipe you'll ever try. Don't forget a tall glass of milk! In a large bowl, beat the butter and the peanut butter together until fluffy. Add the sugars and beat until smooth. Add the milk and the vanilla extract. Add the flour mixture and beat thoroughly. Stir in the peanut butter chips and chocolate chips (if you are using them). Place sprinkling sugar — the remaining tablespoon — on a plate. Using a fork, lightly indent with a crisss-cross pattern (I used the back of a small offset spatula to keep it smooth on top), but do not overly flatten cookies. Cookies may appear to be underdone, but they are not.